Well, some people don’t waste any time. I hardly had time to read my issue of The Fat Quarterly when I found out someone had already gone and tried out the block I created for the issue. Yes, I haven’t even had time to toot my own horn (that will come in a few days – stay tuned for what the challenge was and how I came up with this block!) Here is my virtual version of the block. 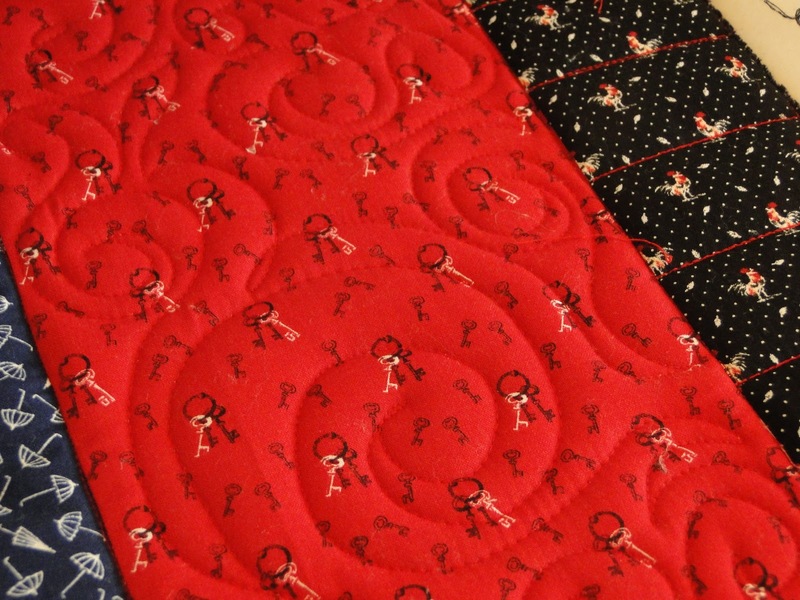 It used fabric from the Spin Fabric line by Windham. In the meantime – have a look at Debby’s blog to see what she did with this block I designed. And — check out The Fat Quarterly now! 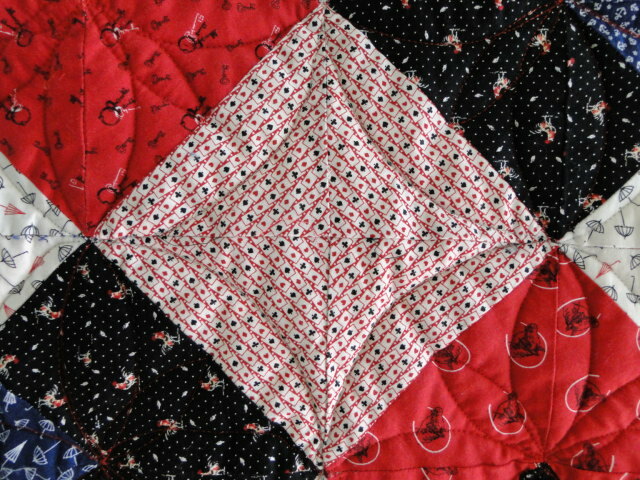 A pattern for a quilt featuring this block is featured in the article. The book begins with a section entitled Design Inspiration. 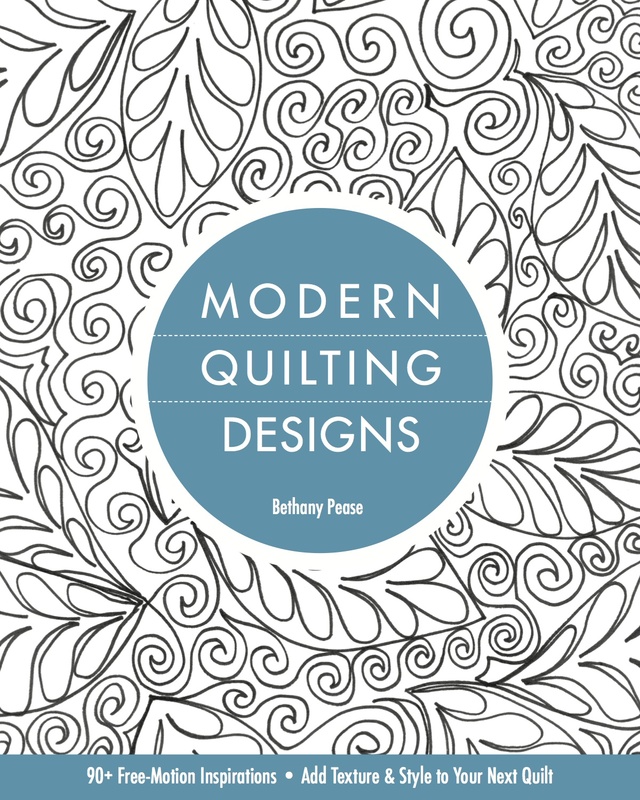 In this section Bethany shows us how she takes a photograph – it might be a fern, it could be some jewelry – and uses it as inspiration for quilting designs. Personally, I have been collecting photos for this purpose but have never moved to the next step – this section is giving me the needed nudge to pull out some pictures and see what I can come up with. The remainder of the book is what I would call a design library. Each of the subsequent sections: The Essentials Freehand Background Fillers), Doodle Away (Continuous-Line Designs), Showstoppers (Unusual, Fancy Continuous-Line Designs), Nature’s Patterns (Feathers, Ferns, Vines and Leaves), and Dynamic Focal Points (Medallions and Borders) present a wealth of different ideas. It is refreshing to see how Bethany has taken some designs we may have seen in the past and added her own look to them. She also gives us many new designs that we can use and adapt in our own work. The final section, Mix It Up (Design Combinations), was a great surprise and a welcome one. Here she shows how she might combine some of the designs presented in this book in a single quilt. 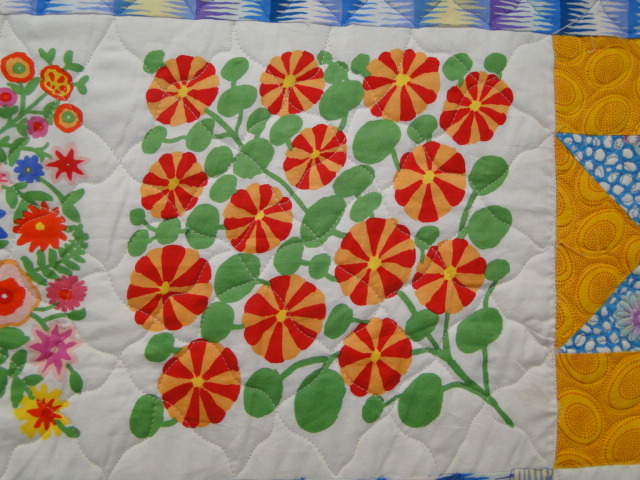 By that I mean – a central design for the body of the quilt, a different design for the small narrow inner border, and finally a design for the other border. I might not have thought of some of the combinations she presents – but guess what – they work! This is a great book to have in your library and to pull off the shelf when you have “hit the wall” and don’t know what to do. 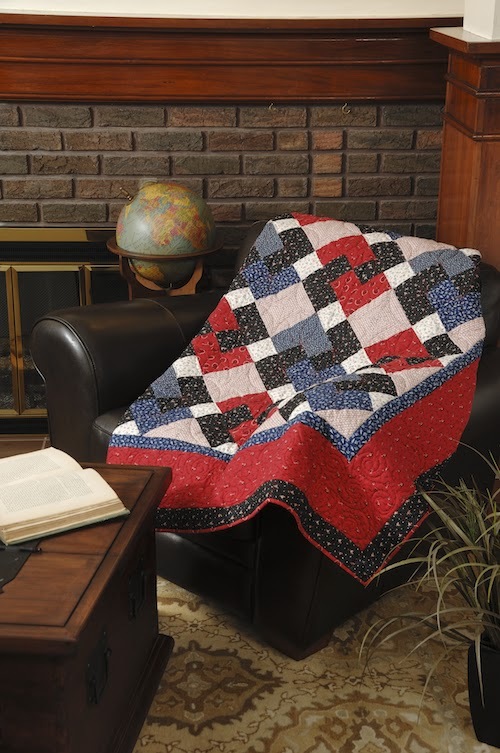 I think it can help spark your own creative imagination as you seek to develop and let your own quilting style grow and evolve. 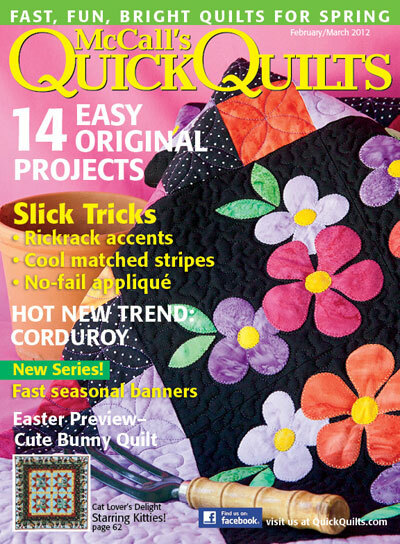 I have a quilt featured in the recent (Spring 2012) issue of Easy Quilts from Fons & Porter, entitled Card Tricks. 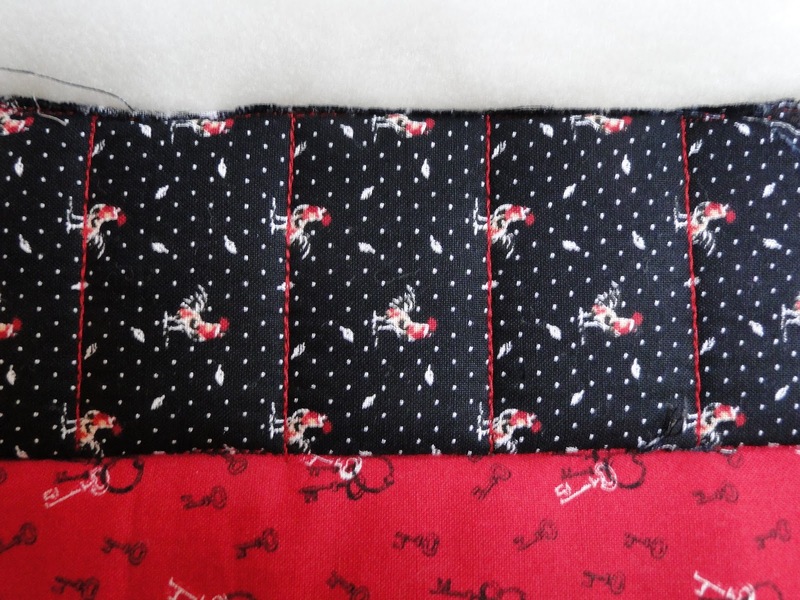 It features the fabric line Ascot from Windham Fabrics. 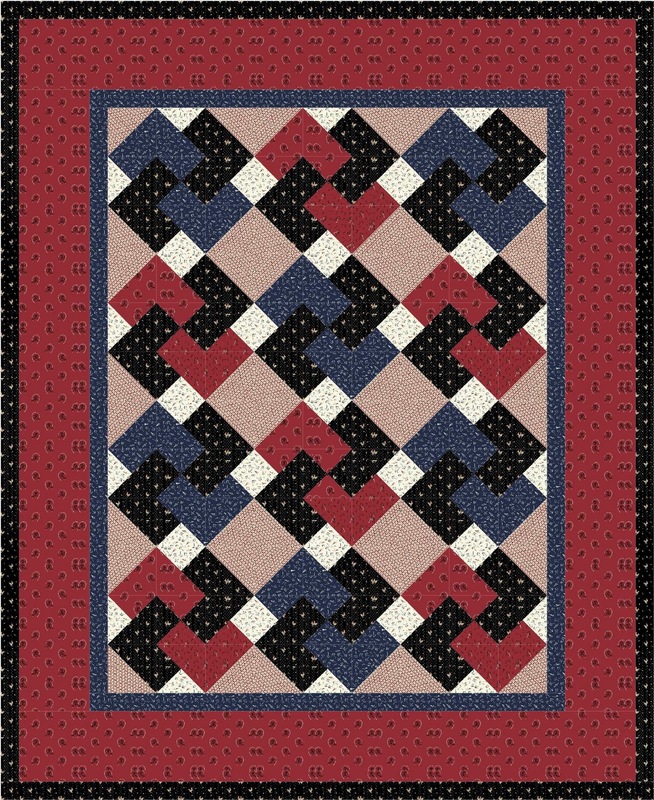 I designed the quilt using the EQ7 software. 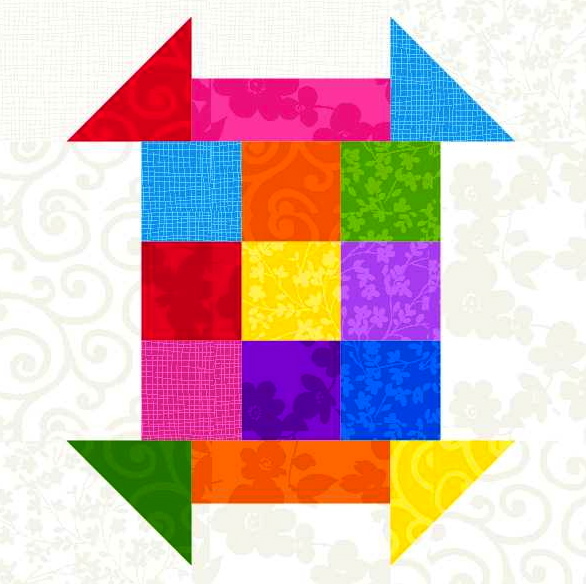 I think the “virtual quilt” presented a very accurate rendition of what the actual quilt would look. 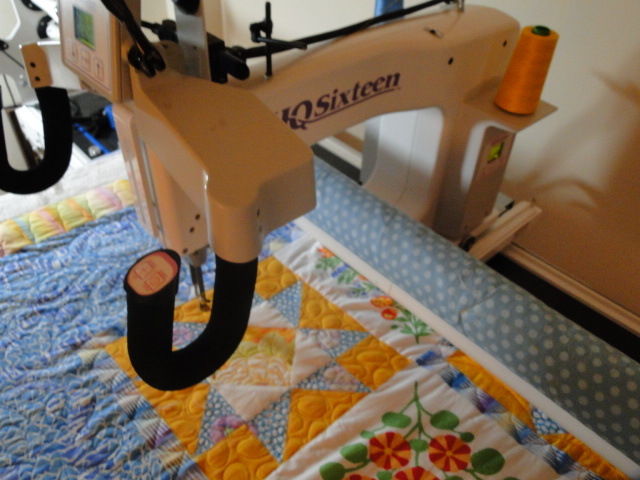 Here are some pictures which show how it was quilted on my HQ 16 using Aurifil 40 wt thread. 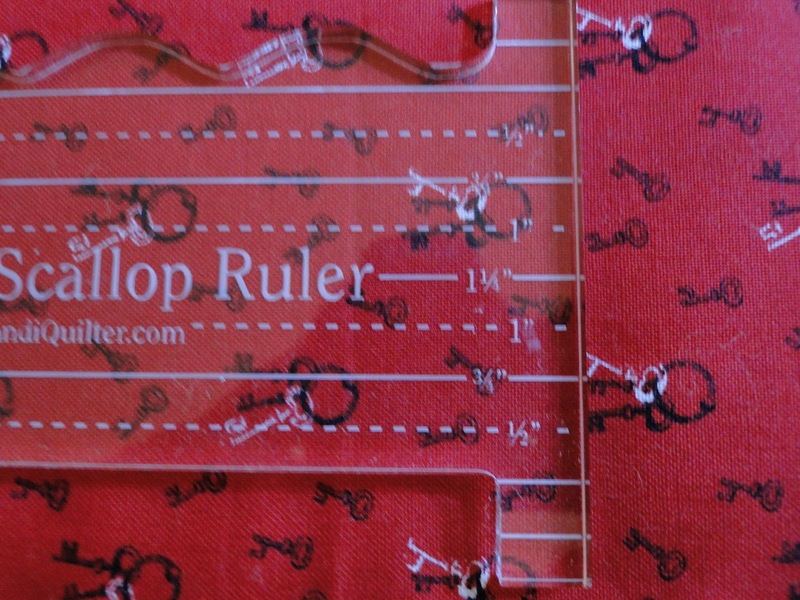 It features a great deal of ruler work and some free motion designs in the wide border. 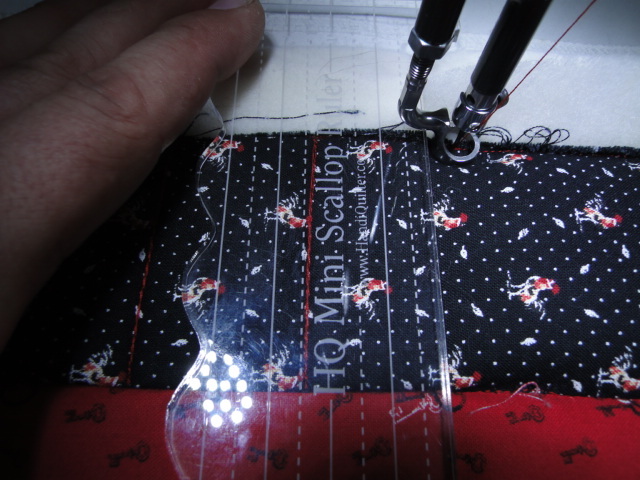 In the narrow outer border I quilted a piano key design using the straight edge of the Mini-Scallop ruler from HQ. 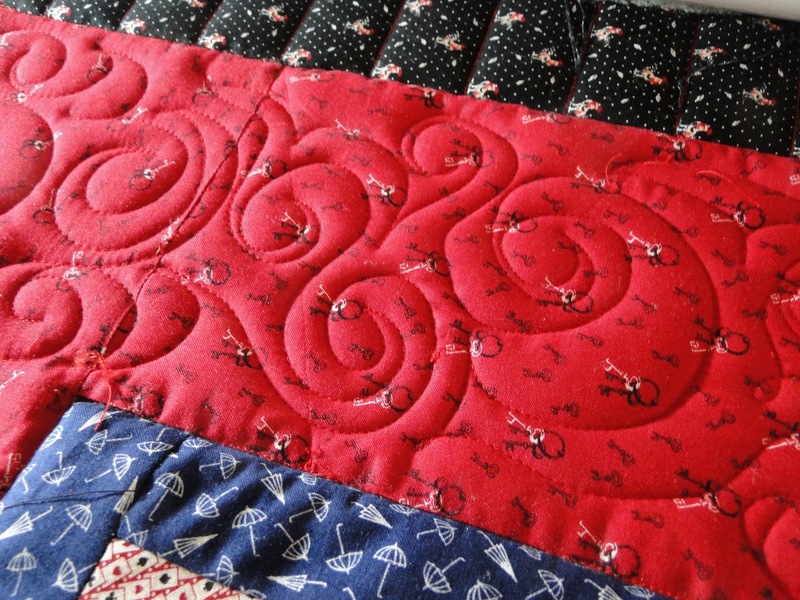 In the wider border I quilted a swirling pattern. I was at a loss about what to quilt in the blocks and I had a nice chat with my friend Debby Brown and she suggested this pattern. I really like how it turned out. This shot of the back of the quilt gives you an idea of the overall quilting. 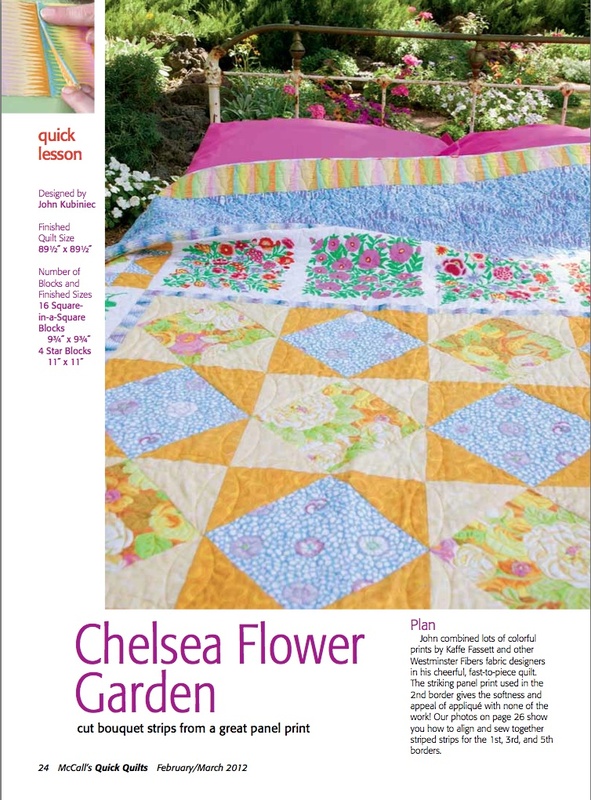 The February/March issue of McCall’s Quick Quilts features my quilt Chelsea Flower Garden. 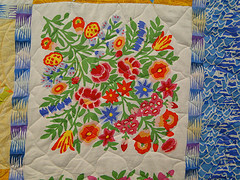 It is made using a panel that Kaffe Fassett created. 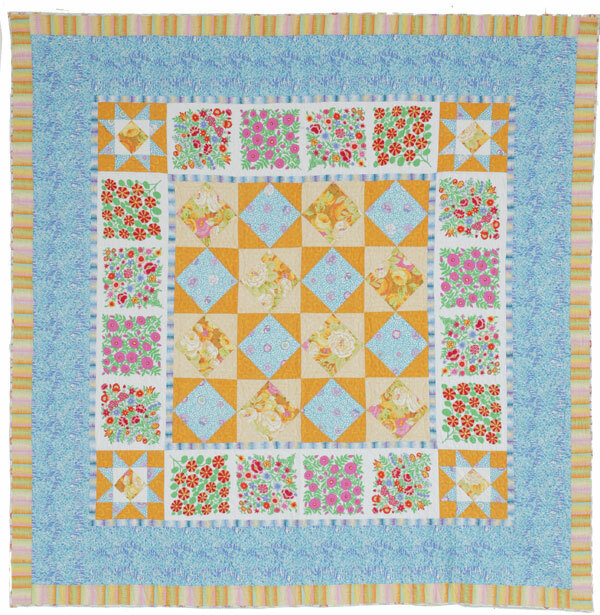 It is a great quick and easy quilt to put together – perfect for giving a hint of Spring to any bedroom. 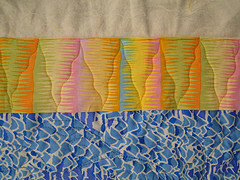 McCall’s also did a great job showing how I spliced the striped fabric together for the borders. To have the stripes run the way they do in the quilt you need to cut them the width of the fabric (WOF) – and to get a border strip long enough you need to join strips together to fit the length of the quilt. They have a great photo spread in the magazine to show how I did this, but they also created a “how-to” video that is on their website. 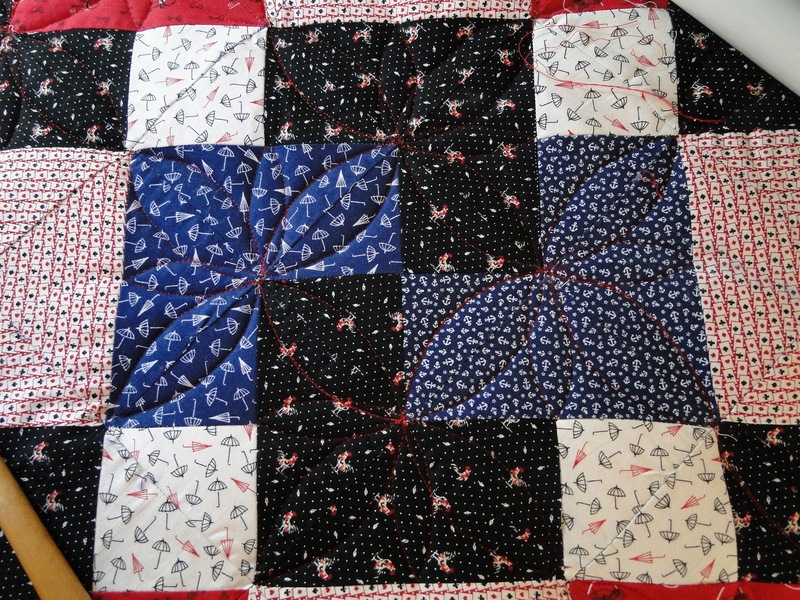 When I quilted this quilt, I could have done an easy edge-to-edge design, but I wanted to do something special for this quilt. Here are some pictures to show you what I did. I quilted this on my HQ 16 using Aurifil 50wt thread. 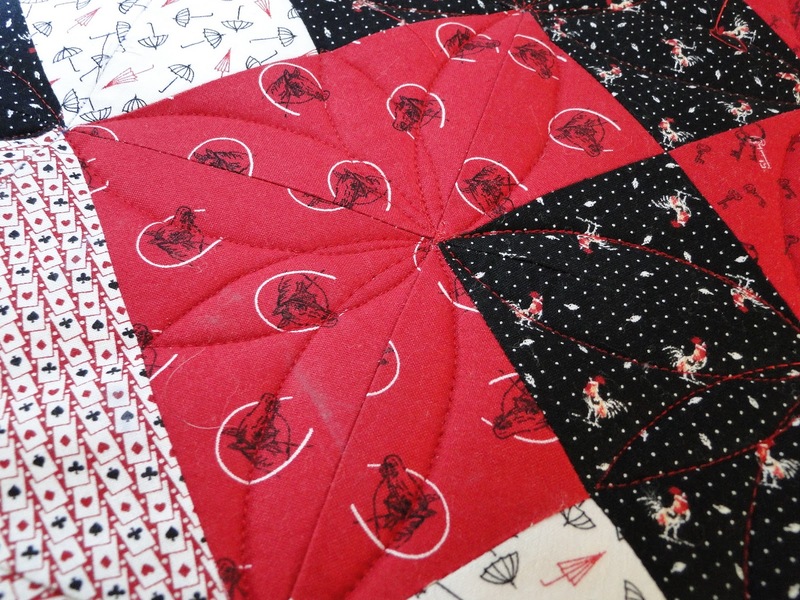 The quilting was a combination of free form quilting and ruler work. 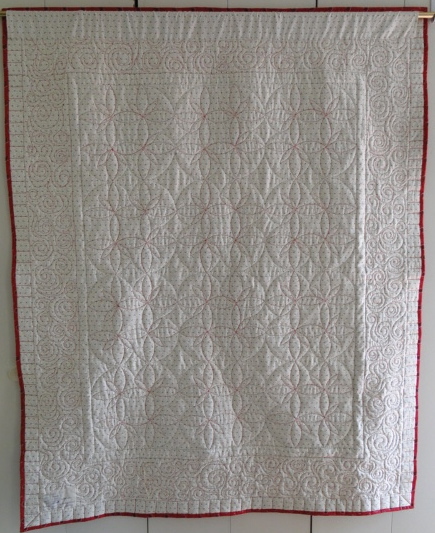 While I quilted this on my longarm -you could easily accomplish the same look using your domestic sewing machine. 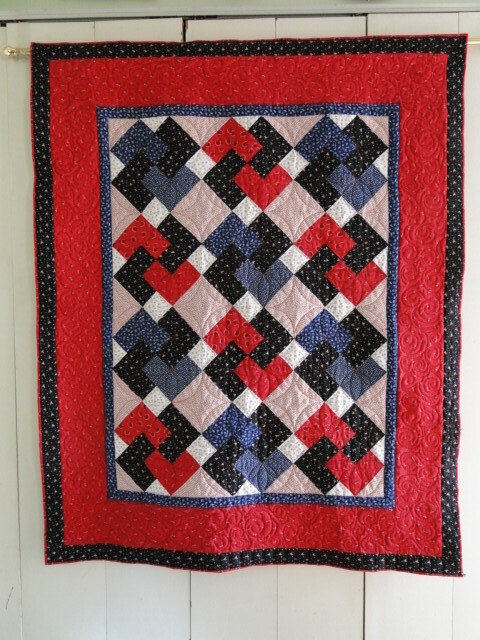 I quilted a wavy pointed design in both of the stripe borders. I was thinking of doing it with straight lines but the nature of the fabric suggested something a little looser. In the panels I quilted a wavy grid. Kaffe’s fabrics call for a more casual approach to the quilting. I felt that a standard grid would be a bit too formal for these fabrics. 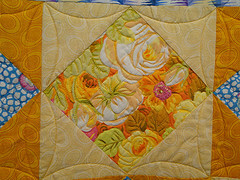 In the Center Blocks I did some detailed free-form outline stitching around the floral fabric. I simply let the fabric tell me where to quilt. I added simple arcs which created melon shapes where the blocks connect. 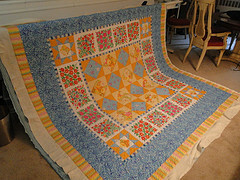 In the corner star blocks I again followed the floral patterns in the center of the blocks and then quilted pebbles in the star points and quilted ovals that followed the print of the gold fabric. 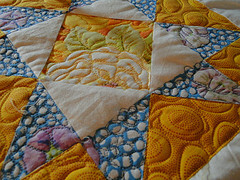 Stitching in the ditch around the white triangles help to make this part of the block “POP” and frame the center portion of the block. 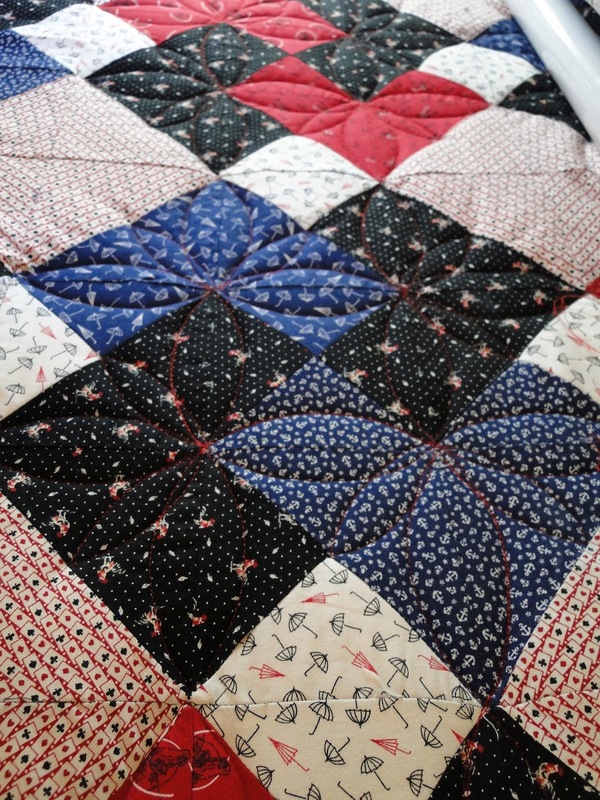 I hope that this might give you some idea of how you might quilt this quilt – or how to quilt other quilts that might use similar blocks or similar fabrics.